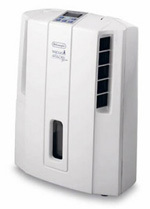 DeLonghi dehumidifiers are sold both in the USA and the UK. Although the ranges available in the two countries are similar there are differences in their technical specifications and in the units of measurement used to describe their capabilities; pints per day in the USA vs litres per day in the UK for example. For that reason this page is split into two halves. The first half deals with models sold in the US market while the second describes the range available in the UK. Visitors from the UK may wish to scroll down to the relevant section. In this section I shall introduce the DeLonghi range as sold in the USA. Following a brief introduction I shall pick out the main points about each model in turn and provide a link for you to follow to my full review of each model if you would like to read it. Although these units are technically competent I am unwilling to make a general recommendation in their favor for reasons which will soon become clear. 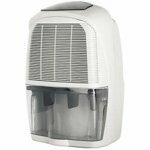 For certain specific uses, however, DeLonghi dehumidifiers can be ideal and you may find it useful to read the rest of this short page to find out why. 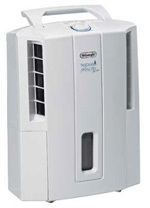 DeLonghi dehumidifiers are manufactured in Italy. They are well made by current standards although, like all portable models, they have relatively short working lives. All three models in the range are low capacity units. The "pints per day" ratings given by the manufacturer have been established at European standards and when comparing them with other popular brands, such as Danby and Frigidaire, the stated capacity should be halved. The "50 pint" DD50P, for example is a 25 pints per day unit when tested in the conditions under which a Danby model would be rated. 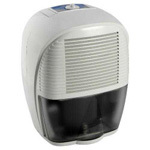 The DeLonghi dehumidifiers range is quite expensive when compared with many popular brands. In part this reflects the moderately higher quality to which these appliances are built but the main reason is the higher cost of manufacturing in Italy when compared with China, where most portable dehumidifiers sold in the USA are made. Despite this unpromising introduction the DeLonghi range does have some qualities which may appeal to some of you. These units are quiet by dehumidifier standards, light in weight, compact and two of the four models have a built in condensate pump. For certain uses, in a bedroom where a quieter dehumidifier may be preferred, or a recreational vehicle where light weight and small size can be important, a DeLonghi model may be the right choice. It all depends on your priorities and what you are prepared to spend. What I will say, categorically, is that none of these units is really powerful enough for any but the smallest of basements. The DD50P is the top model in the range. The "P" indicates that this is one of the two models incorporating an internal pump. The DD50P is suitable for smaller areas and, despite anything you may read elsewhere, I would not recommend that you use this model in an area much over 400 square feet. This capacity suits the DD50P for use in a single room of your home, such as a bedroom or study, and it is powerful enough for even one of the larger type of RV's. The integral pump may be useful if there is no convenient drainage outlet but please be aware that the pumps incorporated in portable dehumidifiers are unlikely to have a particularly long working life. The DD45P is virtually identical to the DD50P and all the comments made immediately above apply equally to this model. The main advantage of the DD45P is that it is a little less costly than the DD50P and, for that reason alone, would be my preferred choice of the two. The minimum operating temperature for both these models is 41ºF but neither is suitable for continuous use in temperatures below 65ºF so don't choose it for your garage if it's cold in winter! Although far from silent you will find this model quieter than most and this is one of the main reasons people choose the DD45P in preference to other, cheaper dehumidifiers. The DD45 is the DD45P without an internal pump. Unless you absolutely need the pump the less expensive DD45 is much the better choice. In common with the rest of the range the DD45 is operated using electronic controls which have been praised in consumer reviews for their ease of use. The air filter is washable, the unit comes with an auto-restart function (following a power outage) and uses the eco-friendly R-410A refrigerant to protect the ozone layer. The DD45 has all the advantages of the other two models I have described but is cheaper and, with no pump, has less to go wrong. It is my pick of the range if you asked me to make a recommendation. Welcome to the UK section of this page. Here you will find a brief introduction to each of the DeLonghi Dehumidifiers sold in Britain, a picture of the unit and a link to my full review and a detailed specification if you would like more information. 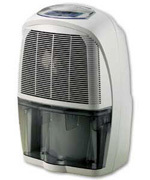 DeLonghi dehumidifiers are made in Italy and are designed for typical European homes and weather conditions. They are of good general quality and in price terms fit between the slightly more expensive, British made Ebac range and the cheaper brands which are almost all manufactured in China. Consumer reviews of the range are generally positive. Users like the compact design of these units and they are generally reported to be quiet and effective. You will find both positive and negative comments in my reviews and the units I recommend are the DES models and, for certain applications, the DNC65 desiccant dehumidifier. If you are looking for a model that will work well in low temperatures the DeLonghi DNC65 should certainly be on your short-list. The DNC65 doesn't condense water on to cold coils so there is no problem with ice forming inside and no need for the unit to stop working while the ice melts. The DNC65 is a desiccant, or water absorbing, model and will do its job even when the temperature is just a few degrees above freezing. You may find this useful if you need to control humidity in your garage or boat during winter where a traditional refrigerant unit performs poorly. There is no compressor in the DNC65 so it is more compact and weighs less than most other portables. It is also a little quieter. It is not all good news as the desiccant type costs more to run and pulls less water from the air than a refrigerant unit at normal room temperature. I can recommend the DeLonghi DNC65 for your cold garage but I don't think it's the ideal choice for rooms inside your home. The DEM 10 is small, light weight and relatively quiet. For a modest price it comes with everything needed to control moisture a small apartment or part of a larger home. With a built in carry handle the DEM 10 is easy to move from one location to another and its modest size makes it ideal where space is at a premium. The DEM 10, like all DeLonghi dehumidifiers, is fully featured with an adjustable humidistat, auto defrost and a continuous drainage facility. It is also an attractive appliance, for those who find these machines noisy, with an output of only 38dB. For anyone living in a flat or apartment where excessive moisture is a problem the DEM 10 is well worthy of a second look. The DeLonghi DES12 is a 12 litres per day model suitable for smaller areas and ideal for flats/apartments due to its compact and stylish design. Weighing only 9kg yet with all the power needed it is the perfect choice for the smaller home. Features include a humidistat with which you may set the level of relative humidity you wish to maintain, continuous drainage in order to avoid the chore of emptying the water collection bucket every day and an auto defrost system to protect the refrigeration system from damage if the temperature falls very low over night. Although all dehumidifiers are noisy this unit is quieter than most and although you may not wish to sleep with it in your bedroom it will be less intrusive during the day than many other models. The DeLonghi SLIM DES 14 is compact, light weight and, with castors included, easy to move about the house. It is a medium capacity unit suitable for most family homes and comes with an adjustable humidistat to pre-set the desired humidity level and to reduce energy costs. In essence the DeLonghi SLIM DES 14 is a more powerful version of the DES 12. This is obviously the one to choose if you have a larger area within your home where humidity needs to be controlled although you may prefer a more powerful unit because it will not need to run for so many hours per day in a given area. Although, like all DeLonghi Dehumidifiers, a relatively quiet unit it will make some noise and running for fewer hours will reduce any nuisance this may cause. It also saves energy and this may outweigh the extra purchase cost over its life-time. For those with a larger home the DeLonghi SLIM DES 16 offers all the advantages of the 14 but with a higher water extraction rate. Its slim design, and the positioning of its air intake and output vents on the side, allow it to be located flush against the wall to save even more space. With similar features to the DES 12 and DES 14 the DES 16E brings yet more power and is still able to operate with a noise level of only 42dB. I will not pretend that it is silent, and I do not use phrases such as "whisper quiet" on this web site. In fact the only dehumidifier fit for anything larger than a closet that is whisper quiet is one that has "died" on you. Nevertheless the DES 16E is quieter than most of its direct competitors and will be easier to live with as a result. 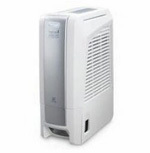 The DeLonghi DEC180E is a medium/high capacity dehumidifier with a water extraction rate of 18 litres per day. This is an effective and energy efficient unit with an "Eco Setting" for low energy running. Like other DeLonghi Dehumidifiers this unit operates relatively quietly for its size but its greater water extraction power can only be achieved with a more powerful compressor and a larger fan. As a result the noise level on the highest setting is 44 dB, still comparatively quiet however. In an area comfortably within its capabilities the higher setting should not be needed very often but comes into its own in "laundry mode". The DES 16E is specially protected against accidental water splashes which makes it ideal for use in a laundry room or utility room. 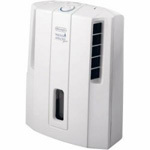 The DeLonghi DEC 21 is a high capacity, portable unit capable of keeping a whole house free from excessive humidity. Unlike many others this model includes a thermostatically controlled heater which can be useful in an unheated home or for drying laundry. It can be used in three modes, heater only, dehumidifier only or combi mode. The idea of combining a heater with a dehumidifier is a novel one but, judging by consumer reaction, not entirely successful. The operation of the heater increases the water extraction rate by three litres per day but at a substantial additional cost in energy. Even in use for drying laundry it is unlikely that this feature would be cost-effective. While we applaud the use of imagination that produced this hybrid our conclusion is that is the "lemon" among DeLonghi dehumidifiers and we are unable to recommend the DEC 21 to our visitors.